Lifeguard Roofing is recognized as a premier national roofing company. We serve both commercial and residential markets in all suburbs of Melbourne. 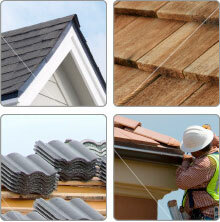 • Curled and cupped shingles – Roof shingles are overlapping elements found on the surface. They commonly come in rectangular shape, flat and overlapping joints. They are made of flagstone, metal, wood, fiber cement, plastic and other composite material like asphalt. The shingles are working good if they stay flattened on the edges. Once they get curled or cupped, water and other debris can sneak into gaps made by curling and cupping. • Missing granules – The shingles are made with a protective covering in the form of pellets. Through time, wind, rain and other natural factors, the granules are eliminated leaving portions of the shingles to be bald. • Dark streaks – Roof decks with dark streaks indicate the presence of airborne algae. The streaks are not harmful, but they could affect the looks of the roofs. A mixture of water and bleach can help remove the stain. The Melbourne weather can have a strong impact on this. • Moss – The presence of moss may not cause the damage at once. However, if the moss stays on the surface for quite some time, the granules begin to disappear leading to the thinning of the single cover. You can brush it off when cleaning but this does not guarantee total elimination of moss. • Leaks – Leaks cannot be easily identified unless you see stains on the walls which are connected to the roof. Leakage is a sign of a hole or improper attachment of shingles. Check for holes during the day and cover these before the rainy season. How often do you inspect your roof? You don’t know! Roofing restorations or repair can be quite expensive if extreme. To get the most out of it, you must undertake roof inspection and maintenance bearing in mind that there are many types of roof covering: the type you have will dictate the kind steps to take to keep it in a good condition. Go through this piece article and ensure that your roof is properly kept in a good condition. 1. Professional roof inspection Some people do a DIY roof inspection by just walking on it or looking from a distance and point out the common problems. Have a professional inspection at least once a year especially after a heavy storm. Professionals will spot any prevailing and potential problems and get rid of them before you even notice them. For clay or concrete roofs, they use special binoculars for a thorough inspection. 2. Keep gutters in good shape and clean Gutters collect all sorts of trash, dirt and leaves from the roof runoff and their clogging can cause great damage to your roofing. Dirt gutters can also hold moisture which causes corrosion of roofing metals. By keeping them in good repair and free from anything you ensure their effective performance in keeping both your roof and roofing files unreachable by rainwater. Give us a call today to schedule a Free Inspection/Consultation with one of our roofing experts. Did a recent storm cause damage to your roof? Give us a call so we can swing by and give you a quote. A new roof may increase your property value. Turn heads as your neighbors pass by with your new Lifeguard Roofing roof. Call us to set up a time for one of our Inspection Agents to stop by and perform a detailed inspection of your roof free of charge. © 2016 Lifeguard Roofing. All Rights Reserved.